Have you been helped by an Angel today? Don't see it on the menu? Just ask your Care Manager...chances are YES we can do that! Elaine Narveson of Dodgeville (at right) is the Client Relations Coordinator for Iowa County residents. 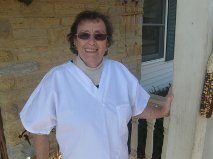 Please call today to schedule a free in-home visit and to review our Care Menu with Elaine!